Yes, marshmallows have always been one of my favourite things! A few days back, I was thrilled to see that a fellow blogger, Mallika, had tried to make marshmallows and posted the recipe on her blog. That made me want to try it all the more. I finally got around to it last weekend. Stephanie's recipe had called for corn syrup and since its impossible to get corn syrup here, I used my usual corn-syrup substitute - honey :) Yes, for all recipes that have corn syrup I have always been successful in using honey instead. And the wonderful hint of the honey flavour in the end-product is a superb bonus. The quantity was a little too much for my little mixer to deal with. Though it did get revived after it cooled down. Next time around I will halve the recipe in order to avoid ruining my favourite kitchen gadget. The recipe said that the marshmallow mix had to be whipped for 10 minutes at least. Even though the marshmallow mix had been whipped for a minute less, it still seemed fine - it was fluffy and tripled in size. But only later did I realise that the 1 minute lack of whipping made the marshmallows a tad too sweet. But guess what! After a couple of days the sweetness reduced on its own after it dried out a little. So the solution to marshmallows that are a little too sweet is to allow them to sit for sometime. I wonder if keeping them under a fan might speed up the process to a few hours. 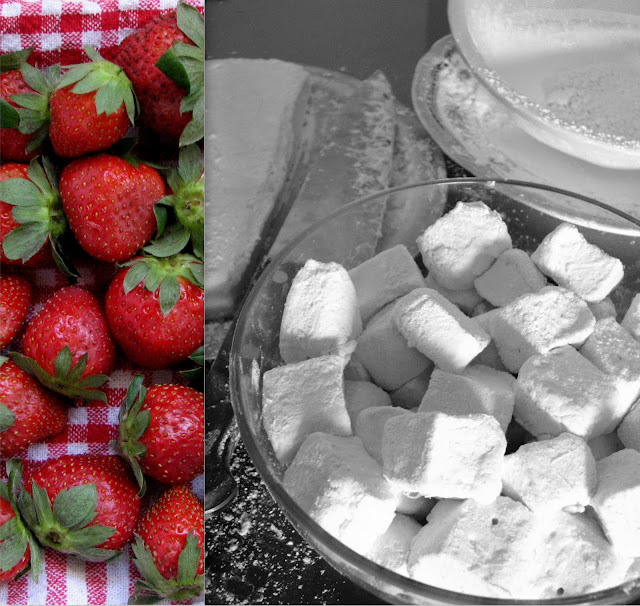 One of the ways we like to eat marshmallows is with strawberries. The fruity tartness of the strawberries balances out the sweetness of the marshmallows :) These marshmallows tasted fantastic when they were grilled as well. The caramelised outside was slightly bitter and added to the dreamy flavour. I highly recommend halving the recipe if you are using a hand-held mixer to whip up the marshmallow mix. Sift together icing sugar and Corn flour and keep aside. Line a wide rectangular pan with aluminium foil or butter pan and grease the lined pan lightly. Dust the lined + greased pan with icing sugar + cornflour mixture. Put sugar, salt, honey and remaining cold water in a sauce-pan and bring to the boil. cover the sauce-pan for a couple of minutes till all the sugar melts. Start beating the water + gelatin mixture on a low speed. Gently pour in the hot syrup in a thin stream along the side of the mixing bowl. After pouring in the sugar syrup completely, whip the mixture on high for 10 minutes till the mixture is soft and fluffy and tripled in volume. Add vanilla and whip for another minute or so. Pour this whipped mixture into the lined + greased + dusted pan to about an inch thickness and smooth out the top with a wet spatula or the side of butter knife dipped in water. The mixture will be very, very sticky. Let it set uncovered for 12 hours. Then cut into squares and roll in the icing-sugar + cornflour mixture to get rid of the stickiness. Whether it be as it is, grilled, with some fruits or with a cup of hot chocolate, these fluffy treats will bring out the child in you.